WIP Wednesday Quilt Blocks and Blouse! Do you find the end of the school year a time of insane activity? Parties, Field Days, Awards ceremonies and sleepovers before everyone leaves on holidays! So much activity here this past week that I completely forgot to post some of my quilt blocks and other sewing adventures! The first is The Splendid Sampler Block by Laurie Simpson! This appliqué block is a breeze to stitch together and really very adorable! 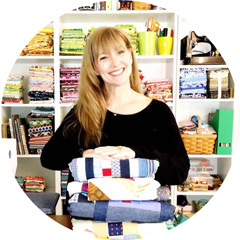 I love how the Liberty Lifestyle quilters cottons sing on the Zen Chic Modern Backgounds! For perfect appliqué stitches, I used Aurifil 50 wt! To get this free block pattern visit here! The Economy Block has been on my list of somedays for what seems like forever. I made my very first this morning! Not sure why it was pinned to my cork board in my sewing room for so long! Less than 20 minutes ( including the time it took me to choose the fabrics) from start to finish! I had to fussy cut the Heather Ross VW bus...it is my dream car! I surrounded that with the gorgeous brown floral in the Katie Jump Rope line by Denyse Schmidt for Free Spirit and the final round is from Lush by Erin Michaels for Moda Fabrics. All in all a pretty FABULOUS block! There will be more of these appearing very soon! My handmade wardrobe grew this week by adding in another Shoreline Boatneck blouse pattern by Blank Slate Patterns. I had this Anna Maria Horner voile in my stash for so long, I cannot even remember where I purchased it. I am very thrilled that I did because it is the perfect summer weight! For construction, I used Aurifil 40wt. Someone asked if I used 100% cotton for garment sewing. I do! I use the 40wt for garments and also for any other project that will be a high use item. Bags, baby clothing and bibs pouches. They all need a thicker durable thread. The Aurifil 40wt is the perfect all purpose thread weight! From cutting to finish took about 2.5 hours. I started cutting the pattern out right after lunch. Showed up at my daughter's school to pick her up with a finished top! Her eyes lit up and she smiled and said " You made a new top...NICE!" Do not be surprised when you see about 20 more of these easy and very wearable tops in a variety of prints! I am trying to sew through my stash and challenge my sewing brain at the same time. I have been enjoying the new ways of thinking about what I am sewing, from the colors chosen to the new patterns and techniques being learned.